Home » Rock Band for Kids! Kidzrock is a music program that teaches children as young as 4 how to play an instrument in the setting of a real rock band. Band members rotate on drums, electric guitar, and keyboard as they prepare to sing and play in a rock concert. Each band sings and performs songs featured on the Kidzrock CD. The songs are composed specifically for the program and use simple music patterns allowing this age group immediate access to musical performance. 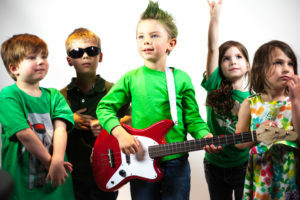 Kidzrock brings kids music lessons to a younger audience than ever before. Kidzrock is the choice for Kids Music Lessons. Call us for the current Kidzrock schedules! Cost : $100 per month to attend one 45 minute class per week. -How to play in a rock band! Dave Simon, owner of Dave Simon’s Rock School in St. Louis, developed Kidzrock in 2010. He originally founded Rock School in 2003. The school catered to pre-teen and teenagers. Dave wanted to broaden his school’s appeal by offering programming for a younger age group. Private lessons proved to be a challenge for children younger than 7 due to the mechanical challenges for smaller hands. Dave observed from his own young children that they had basic sense of rhythm and melody. He devoted a year to experimenting with instruments and song structures that would utilize young children’s musical strengths making playing in a rock band a reality. Word about the program spread quickly and it became an immediate success in St. Louis. Kidzrock is now offered in arts centers, music schools, elementary schools and summer camps around the country. Kidzrock is the only program in the US that makes the rock band experience accessible to children as young as 4. Kidzrock is licensed to over 14 music schools in Missouri, Illinois, Ohio, North Carolina, Texas, Michigan, Alabama, Louisiana, Massachusetts, California, Colorado, and Arizona. This new approach to music education is proof that you are never too young to rock ‘n’ roll!